Closed for lunch 12:00 to 1:00p.m. 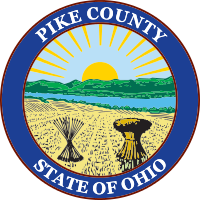 Judge Robert N. Rosenberger was elected Probate and Juvenile Judge of Pike County in November of 2012 to serve out the remainder of an unexpired term. Judge Rosenberger was re-elected to a new six-year term in November of 2014. As Judge of the Pike County Court of Common Pleas, Probate and Juvenile Divisions, Judge Rosenberger serves as both Judge and Clerk of both courts. Prior to attending college, Judge Rosenberger entered the U.S. Marine Corps in 1970 at the age of 17 and was honorably discharged in March of 1973 at the rank of Sergeant E-5. Judge Rosenberger attended Ohio University and received his Bachelor’s degree in 1978. After earning his juris doctor from Ohio Northern University in May of 1981, Judge Rosenberger began his law career by opening a solo private practice in Waverly, Ohio. In 1984, Judge Rosenberger began his public service career when he was elected as Prosecuting Attorney for Pike County. After nine years serving as Prosecutor, he entered into the law partnership of Catanzaro & Rosenberger, a partnership that lasted from 1993 until June of 2008 when his law partner, Jerome D. Catanzaro, left the practice to become the Pike County Probate and Juvenile Judge. Judge Rosenberger continued to practice law in the partnership of Price & Rosenberger until his election to the bench. While in private practice, Judge Rosenberger also served as the Beaver Village Solicitor for a period of 17 years.